PICS by Dicky Saltonstall, Ella Saltonstall, and Jory Squibb. This is it! This is the treasure of a seven month wait. We might be the first skaters in Maine. 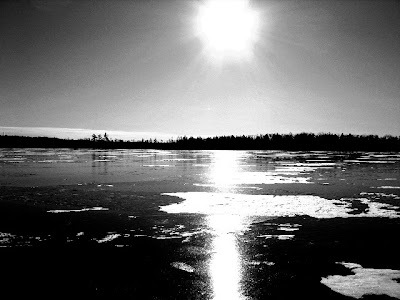 I hesitate to publish some of the day's rituals, as my essential paganism bled through the Buddhist veneer: spread-eagling on the ice. hugging. kissing. talking to it. making deals. promising to return ASAP. After a few circumnavigations, slaloming around the tussicks of grass, the rocky mud bars and many stumps of the swamp's margins, we yielded to the call of a busy day. 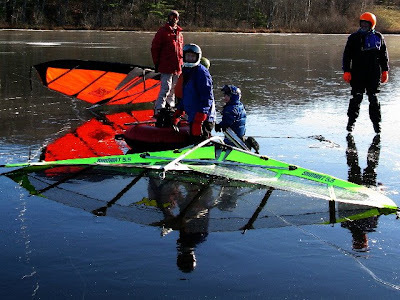 And so I hope today is a further improvement on our activities: Skimbatting on a 7 acre pond on Rt 90 just west of the Rt90 and Rt 17 intersection. It's not much to look at, but should have 2.25" of ice and be suitable for skimbatting and skating. 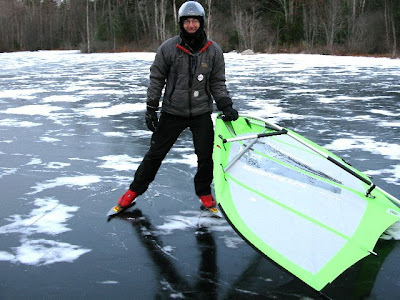 Certainly too small for iceboats. I know it's not worth the trip for our far-flung ice hounds, but I think a good chunk of the locals will be there. Report will follow tonight. Really nice black ice with a smattering of snow drifts you could easily steer around. 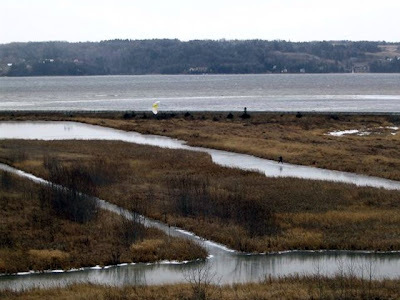 Very blustery NW winds too much for big wings today on this unfamiliar ice sheet. Used 3.8 to check out and explore with Jory Squibb. Some obvious open water; mostly ice is around 4 inches thick, plenty strong and starting to crack into the big plates characteristic of thick stable ice. The 3.8 went pretty well. Saw top speed of 45 mph, but must admit drifts were harder to dodge at top speeds; wind pack enough to make me cautious. Learned old lesson again walking off the ice in a about an inch of snow next to shore. 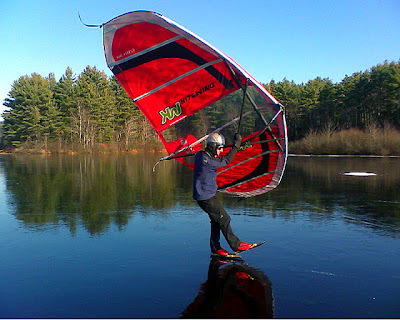 The ice had frozen and the water had gone from underneath as the lake level receded. 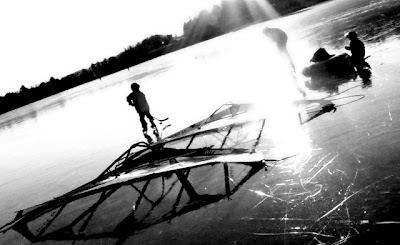 The ice was only about an inch and a half thick supported by air! Through I went up to the knees! No harm done, but renewed respect for the capricious momma whose frozen play ground we enjoy. I fear the currents in shallow Plymouth where the laker level can recede that much under a freeze and realize why there is still open water there. See Plymouth 08/09 album for example of ice. Registration for WISSA 2009 is open, participants are starting to register already! 2) We've got excellent hotel deal for WISSA - DBL room for EUR 51 incl taxes and breakfast. 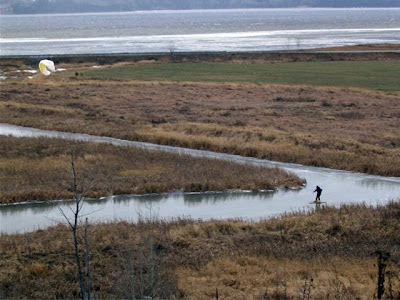 This is our friend Benoit Tremblay scamming fresh black glass on the tributaries to the Saguenay Fjiord just behind his house. Today! This cold snap is money in the bank. Today was the 3rd edition of the Archipelago Rally - an event that is supposed to be fun, easy and a sort of wrap up to the summer sailing season. The first year we did it on the 2nd week of December [too cold], the second year we moved it up to the weekend after Thanksgiving [better]. This year we tried to out pace the cold and do it the weekend BEFORE Thanksgiving. So much for planing - it never came above freezing and it blew a gale! Wind chill numbers were in the single digits. Several boats capsized, and 2 out of 3 windsurfers got smoked. 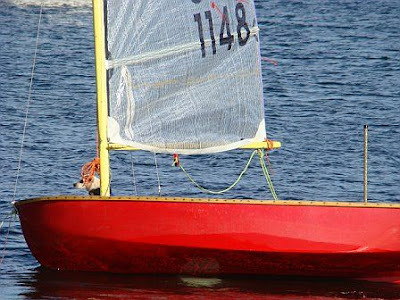 I was able to make the course only by flogging the rig in gusts and trying to sail during lulls. 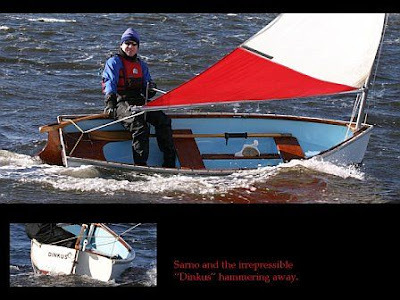 Several wildly over powered sail craft survived the epic conditions, and everyone got back to shore safely. BBQ and Narragansett beer. It doesn't get much better than that! 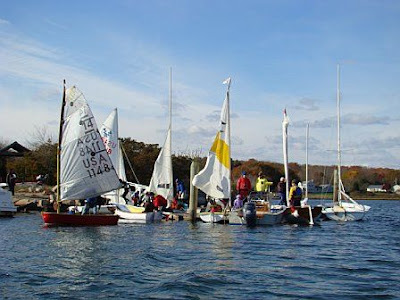 Above: 2006 Spar Island Archipelago Rally (12 craft), at right, Cape Dory 10 "Dinkus"
Above: 2007 Wickford Archipelago Rally (32 craft), at right, Susie the Dyer Foredeck Dog! Here we are again and ready for an amazing regatta!!! 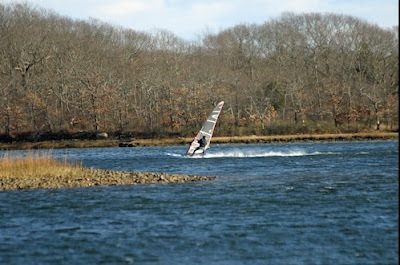 November 22 at Camp Fuller YMCA on the Point Judith Salt Ponds: Plato, Cedar, Albro, Johnathan, Ram Island and more all within a mile on the shallow, flat and protected salt ponds. We have the facility with launch ramp, dock, kitchen, bathrooms and beach all to ourselves!!! Come feel like a kid again!!!! This is the purist form of sailing, getting out on the water for the sake of enjoying the sport and the elements with friends and family. 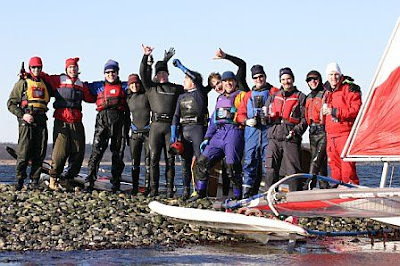 Building on our success of the Spar Island Rally (see March 2008 issue of Sailing magazine feature), and last year's Wickford Harbor Rally, the Salt Ponds will be amazing for sure! We have already received confirmations from more than 35 ralliers for this year and we have unlimited room. The beach party will be taken care of, just bring some beverages and $5 to donate to the Camp Fuller YMCA and their amazing summer program that introduces sailing to children who otherwise would not get the opportunity. 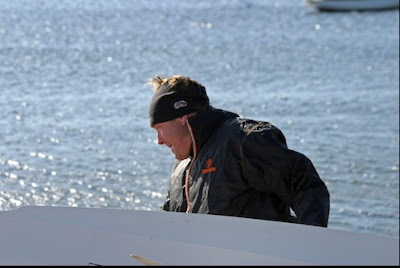 Boats already signed up: Cape Dory 10, O'Day Daysailer, Sailfish, Sunfish, Laser, row/sail canoe, SS Classic Gaffer, Mirror dinghies, Hobie cats, Herreshoff Canoe Yawl, Beetle Cats, Vintage Windsurfers, Sea Dogs and a dozen more one-of-a-kind dinghies!!! Please bring your family and friends and somehting that floats qwith a sail. Camp Fuller is offering a limited number of 420s and JY 15s at no cost to anyone who is interested so please let me know. All you have to do is email me back to let me know the type craft and number of people you are bringing and I will send updates on registration to the group along with the list of competitors and their Portsmouth Yardstick rating, order of starters etc. 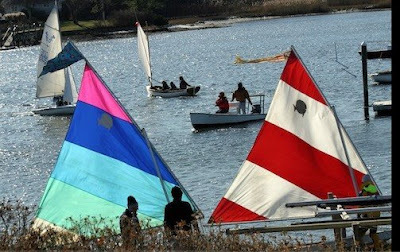 This is strictly sail-in-company-type race, you start in order of slowest boats first in hopes everyone, after sliding and slucing around this great groupof islands, finishes at the same time. 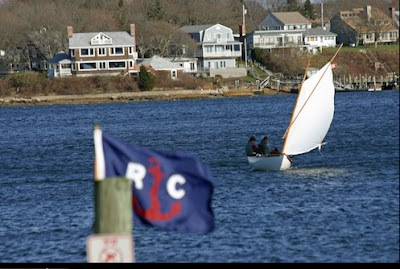 And all racing can be viewed from our location...you will be so close you can hit a sailor with a Quahog!! Please let me know if you have any questions and I can't wait to see you in November! PS-Please pass this along to those you have invited on our behalf and send me their emails.